I've been Matched Betting full time for over 2 and a half years and thought I'd share some useful tips that have helped me along my way with you! We don't just want you to make money, we want you to make money in the least time possible, and to enjoy Matched Betting (as it can be really fun!). Check out the tips below as they can be extremely useful with helping you make £300 profit every month! This isn't a huge one as it can all be done from your phone - but you should definitely get into the habit of checking your emails daily. This is so you can see any offers that are tailored just for you (some bookies might send you a birthday free bet, or a loyalty bonus etc). If there are any offers that you're sent and are unsure of then feel free to post them on the Facebook forum or email us. You can also see if any bookies have sent you the dreaded gub email, which we hope doesn't happen, but if it does it'll be found here! Checking the Team Profit blog each day will keep you up to date with matched betting announcements and new offers that are particularly profitable. Also, if you're an OddsMonkey member I would highly recommend subscribing to the Latest Offers Official forum so you receive notifications of every new offer! Price boosts can be a really good way to boost your income as a regular. Whilst you're not on your phone all of the time, you can still set up push notifications so that you get alerted when one is posted on the Oddsmonkey Forum. This way, when you're around you can quickly jump on it and make a few quid! You may have heard the phrase "min stakes max lines". What this basically means is that when you're on a slot machine that you should set the stake to the smallest amount possible (usually £0.01 - a penny!) and then set the lines to maximum (usually 25). That would mean you're total stake is 25p as you're doing 1p a line. The idea for these offers is to make your stake the lowest. Even when playing roulette or blackjack you should stick to £1 hands as opposed to £5 or even £10. It helps to reduce variance and make you a more profitable player in the long run (and stops you losing as much when you're running bad). Most of you will have been using Betfair for your journey through Matched Betting so far. That's great but for the bigger markets you can consider using Smarkets, as I have been for the past 2 and a half years! I've used Betfair when there's been no money in the market on Smarkets or when they don't have the event I'm betting on. But Smarkets is very good in regards to commission! 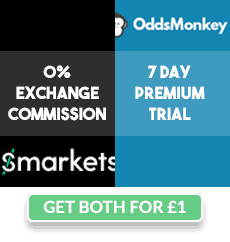 Their 2% commission structure is just too good to pass up plus you can receive 0% commission with OddsMonkey until 31st May. To reduce your liability required, you can combine your liability on the exchange when betting on more than one outcome. Lets say you bet on Horse A and Horse B, the exchange knows that both of them can't win, so they don't need to withhold the liability for both lay bets. Instead, the exchange will only need the liability for the largest liability less the other lay stake(s) you will then win. You basically don't need to deposit for each lay bet - you can just deposit for Lay bet A, and then place lay bet B as the exchange knows they both can't win! Always place your back bet first! Make sure your bet has gone through on the bookmaker, been accepted, and is in your open bets before you place a lay bet. There has been times before where I've placed a lay bet first, and then the bookmaker has either suspended the market, cut the odds, or declined my bet (because of stake restrictions/gubbings). That leaves me with a real pain of a mess to sort out on the exchange, so just make sure you back before you lay. OddsMonkey is by far the best paid Matched Betting service going in terms of customer support and the tools they have to offer. They have a forum full of information and post offers daily (sometimes even every hour!). Their oddsmatcher helps you find close matches with your back and lay bets, and their horse racing matcher and each-way matcher do things that no human would ever be able to do so quick! The best thing is they have a trial offer where it's just £1 for a week. If after the week is up you find it not useful (which is very very unlikely!) then you can walk away, but I promise you there are offers on there that I would never have seen myself had it not been for Oddsmonkey! I hope these tips are helpful and if you have any questions with these, I am available in the Facebook Group and Live Help so please do reach out thanks!